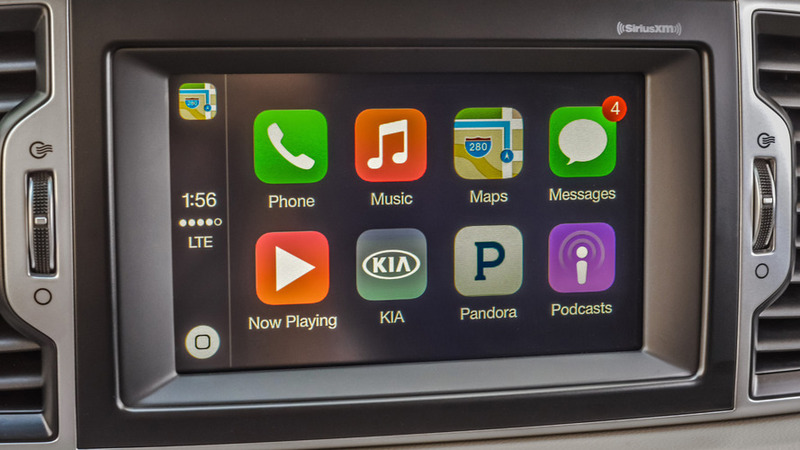 Kia will soon expand the availability of its free Apple CarPlay and Android Auto software update to a handful of older models. In order to receive the update, customers must register at myuvo.com. When the update becomes available later this month, owners will be sent an e-mail that contains a link to the software update and step-by-step instructions on how to install it. The update process will likely mirror Hyundai's do-it-yourself installation program where owners needed to download the software update onto a USB memory stick or the SD card from their navigation system. Once downloaded, owners simply inserted the USB stick or SD card into their vehicle and selected the update option from their infotainment system. Hyundai's update process could take between 35 minutes and four hours, so Kia owners should have plenty of patience. IRVINE, CALIF., July 19, 2016 – Taking the UVO platform to yet another level of enhancement, Kia Motors America (KMA) today announced that free Apple CarPlay® and Android Auto™ software updates will be available for eligible vehicles when equipped with a compatible navigation system4 or UVO35. Customers will be notified by the end of July via email to go to myuvo.com for vehicle eligibility and step-by-step instructions on updating their vehicle with the latest downloadable software. All owners of new and pre-owned vehicles must register at myuvo.com to receive email notifications that the software is available for download. Android Auto™ connects to the user’s Android device and allows them access to smartphone apps and functions through Kia’s UVO infotainment system, such as voice-guided Google MapsTM navigation, hands-free calls and texts and voice recognition. Android Auto™ also lets users stream music from Google Play Music™. With a simple and intuitive interface, integrated steering-wheel controls, and powerful voice actions, Android Auto™ was designed to minimize distraction so that users stay focused on the road. A smarter and more convenient way to use the iPhone® in the car, CarPlay® gives drivers the ability to access the device’s seamless user interface through Kia’s UVO infotainment system. By connecting the iPhone® into the USB port, users are able to make phone calls, access music, send and receive messages, get directions optimized for traffic conditions and more while concentrating on driving. CarPlay® also features hands-free support via Siri®1 voice control or the vehicle’s controls and touchscreen.